God bless America and all affected by 9/11 - today is a day full of hope! Wow! Not really - still only four blocks complete - I make some silly errors and have to unpick - but I really love the outcome! I have discovered I have enough fabrics to make quilts for everyone - a very messy 'Studio', however will I get it tidy again! I thought it was all a bit bright - too many fabrics fighting for top spot. Here's one a little quieter and now I see what I have to do to tone it down. I'm still working on my circles - nice to stitch in the evening while watching tele and chatting to Mum. I love this background fabric - Hope Valley by Denise Schmidt - I'm not sure I have enough, so if someone could be on the lookout for me I would be very happy! It is a very versatile colour and print, don't you think? Oh, another lovely book by Suzuko Koseki, Playful Patchwork. The first red rose of spring - I planted the bush thinking it was Satchmo and then I thought it wasn't - now seeing the dark tinged bud, I think it must be - a very prolific bloomer! I have a busy week ahead with specialists for Ed - he's doing very well at long last thank goodness - it seems such a long time! Labels: Japanese x and + Quilt, Starry Petals. Hawthornethreads.com shows 3 1/4 yards of that Denyse Schmidt print. Search under her name and Hope Valley will come up and you can find it there. I've watched your progress on The Circle Game and decided to sign up for the second round of it. We're on month 3 now and I'm really enjoying it. Thanks for the inspiration. Very happy to hear Ed is doing well. I hope his health continues to improve. I love your circle block. So glad Ed is doing well. 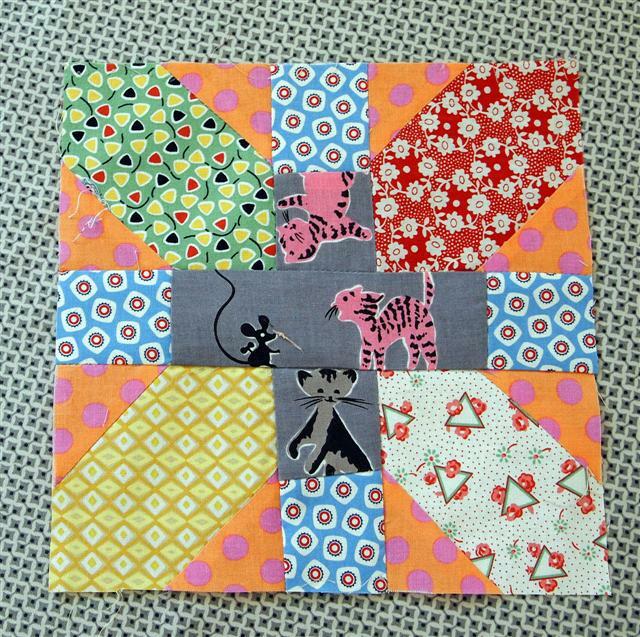 Love the Scrappy Blocks & Especially Your Circle...Glad to hear Ed is doing Well..
oh these scrappy blocks are just adorable. I went to amazon to look and there isn't a preview, is it a book I would like? 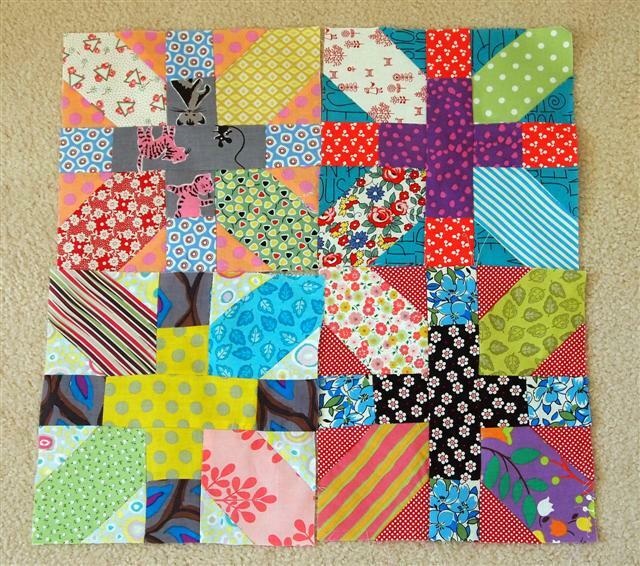 I have lots of scraps and that looks like a fun possibility... especially since you can make lots of blocks and then play with arranging them ... my kind of quilt. 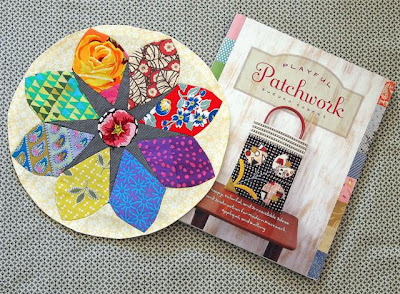 I love your quilt blocks -- so pretty! Glad Ed is doing better now! I don't think your blocks are too bright at all. 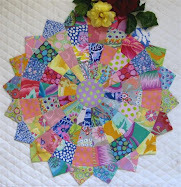 It's one of the things I love about Australian quilters is your use of bold scappy colors. I'm so happy your husband is doing well. Give him our best. Your blocks are gorgeous Lurline. I can see how they'd take awhile just choosing the fabrics for each one. The circle block looks great too. It's always nice to see your roses and I'm happy to hear Ed is doing well. OK, I'M hooked! Other than the 8 triangles of the same fabric and the 4 squares, same, and of course the cross part, are there any rules or hints? 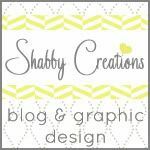 As long as I am cutting scraps, I may as well try this. You and I have the exact same taste. But you have it all over me in technique. Love the circle blocks. Love your first set of blocks - LOVE. And I have that book too! I love your blocks. They fabrics are fantastic. I do see what you mean with the one that is a bit toned down. Your circle block is stunning! I love seeing that. :) Happy to see the rose and real happy to read Ed is healing. The stress of all this was just a bit much!!! Here's to time for happy roses and pretty fabrics. Block looking good! Quite lively!! First rate rose there and your holly hocks arn't bad either. Fine, I'm just addicted! Aside from the 8-10 triangles of the same cloth as well as the five pieces, similar, not to mention the actual cross component, any kind of regulations or methods? Given that I am slicing scraps, I may at the same time do this. For a Little One in England!